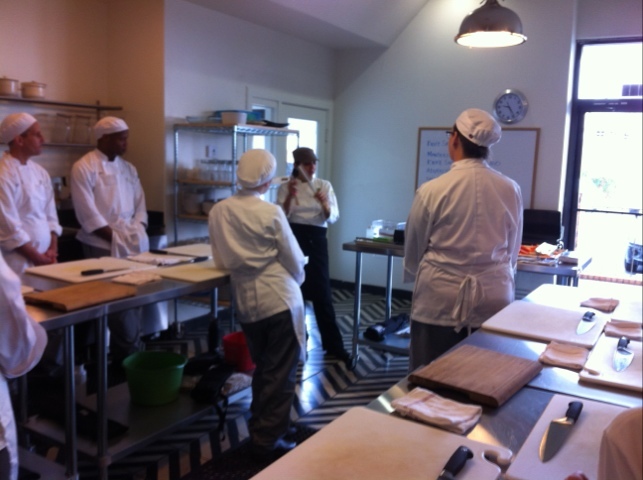 Wednesday and Thursday we spent time with Jean Brooks, a professional baker from Lampasas, Texas. Jean runs Serious Sourdough Bakery and sells her bread to the Monument Cafe in Georgetown and also the Four Seasons in Austin. She is indeed VERY serious about her bread and very knowledgeable. 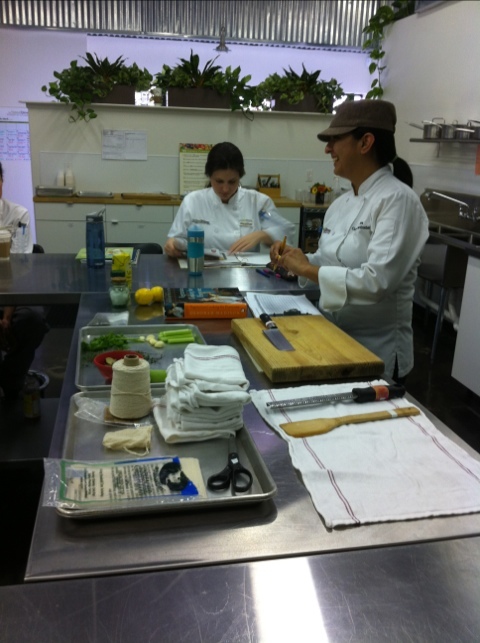 We were very lucky to have her as a guest instructor. Jean is a dynamic baker and her excitement about baking is really easy to see. It’s understandable why she has had so much success. Bread is her life’s work. She brought in some wheat that she grows on her property, which was a treat because I have never seen where wheat comes from. Have you? 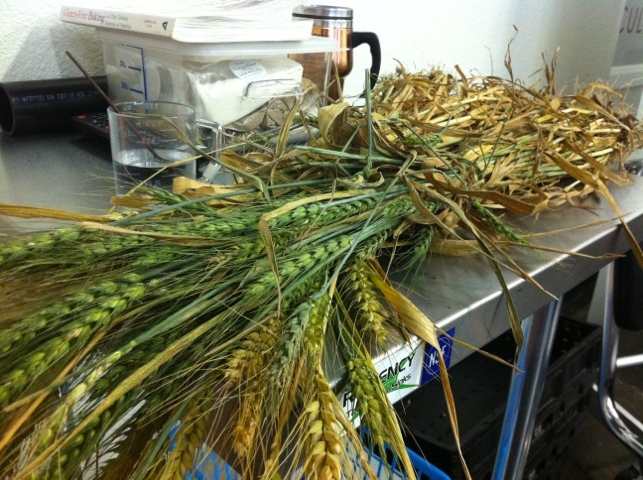 Below: Some wheat (I believe red winter wheat) from Jean’s crop. 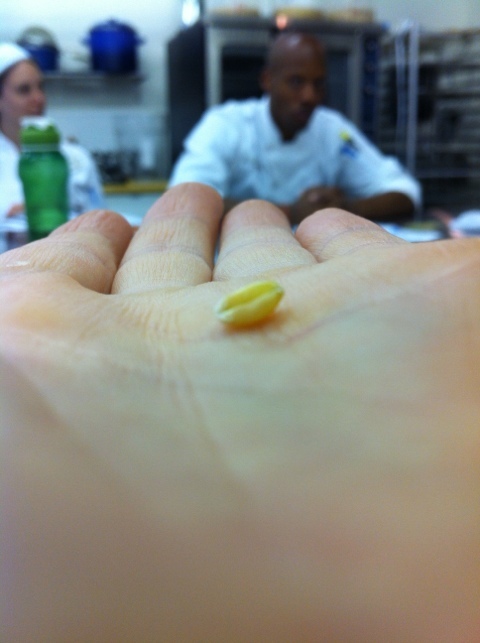 Below: A whole grain of wheat that I pulled from the wheat stalk. Below: We baked this sourdough in class. Jean had us mix dough using her six year old starter. 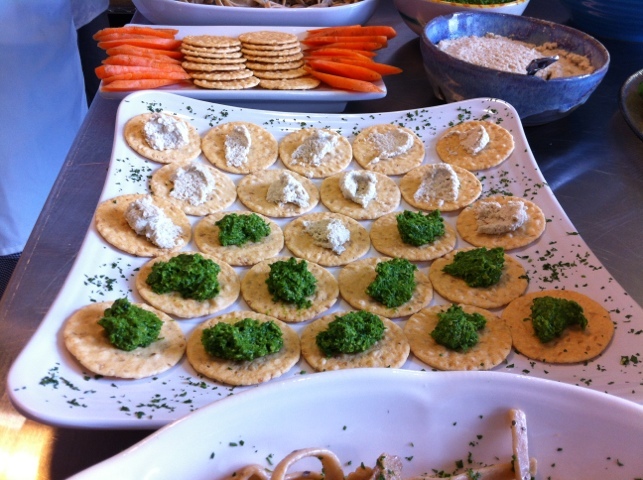 A starter is a naturally fermented combination of wheat and water that is used to naturally help bread rise. Yeast is a common “artificial” rising tool that is added to bread to make it rise faster. Making a starter is a way to foster natural yeasts and bacteria that help bread rise. Jean has been feeding her starter and maintaining the active culture for six years. This is a living fluid. 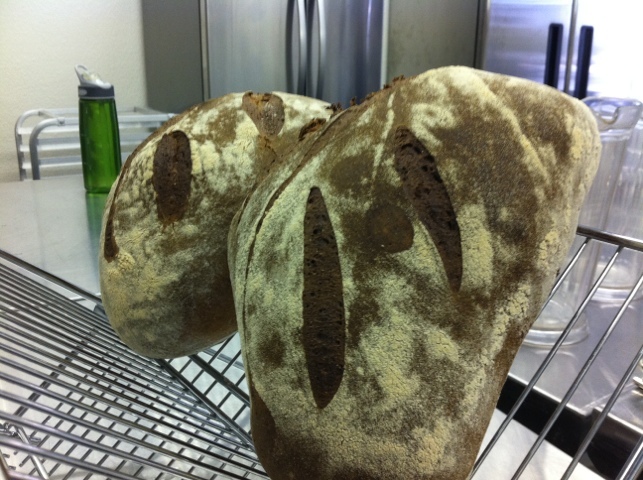 Sourdough is made using a fermented starter, which is where the sour flavor comes from. Jean says it takes her three days to bake her bread: one day to measure the ingredients for all of her breads, one day to mix and let the bread rise, and the last day to bake. The long process helps develop flavor and is a more traditional method of rising bread. We didn’t have that much time, so our bread was not as delicious as Jean’s bread. 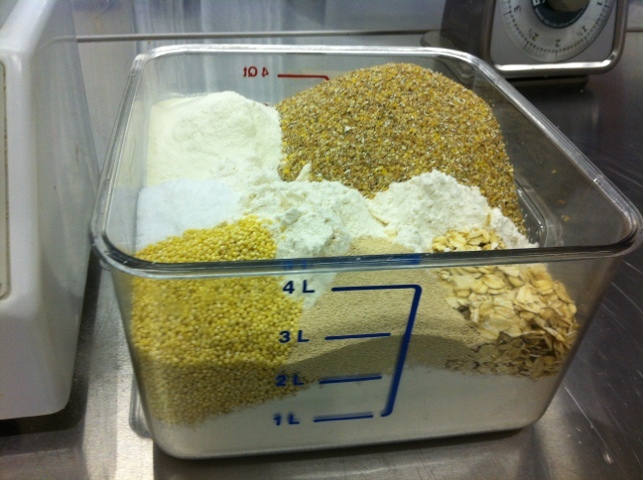 Below: Our multi-grain bread, before mixing. You can see the distinct elements of the bread in the container. From top left: Powdered milk, multi-grain mixture, oats, yeast, millet. 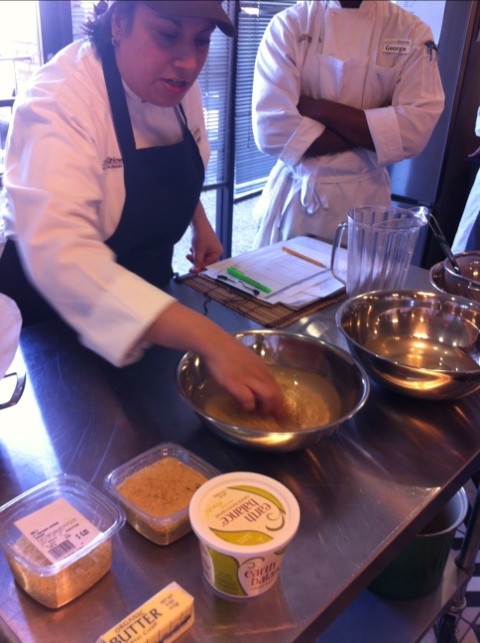 Another cool thing about Jean – she grinds her own flours. Regular flour that you buy in the store is at least partially rancid. 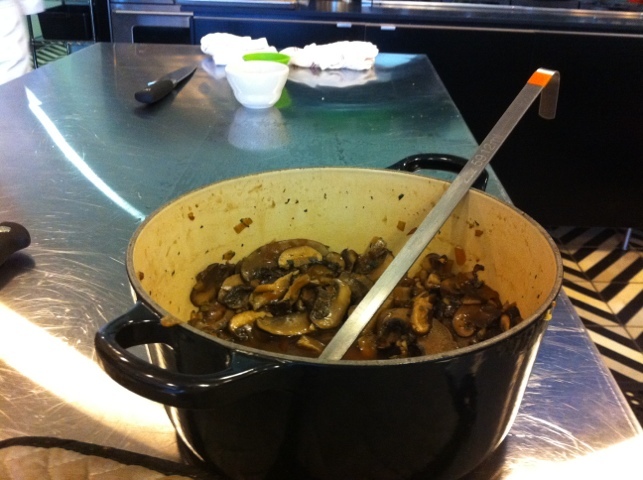 After a grain is ground the oils oxidize unless the flour is kept very cold. So, unless you buy flour out of a freezer case or your bread was made from flour stored in freezers, your bread is rancid. 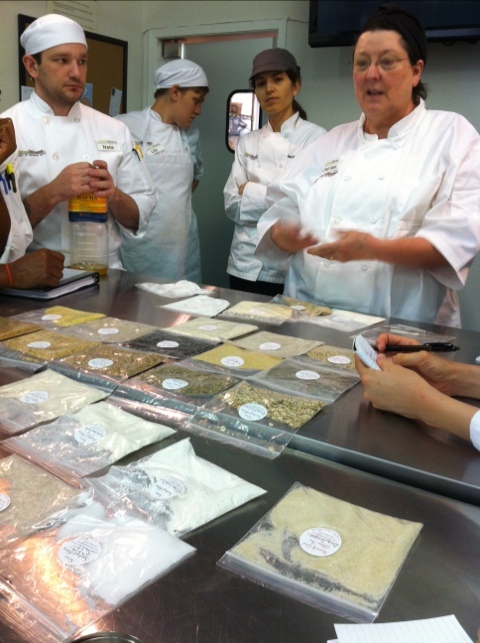 To get the freshest flavor, Jean grinds her own flours from grains using a massive grinder. 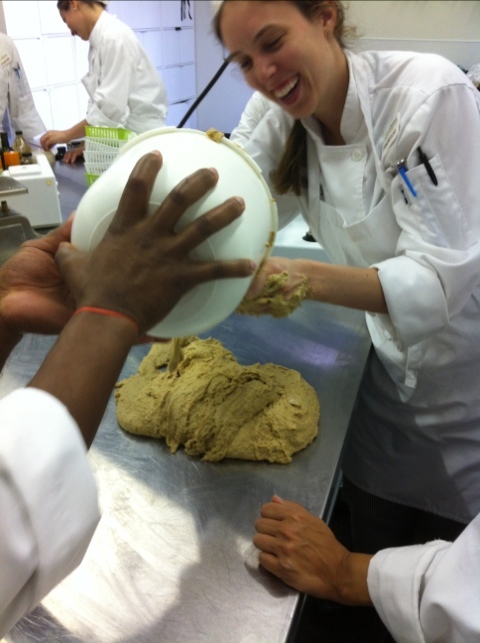 Below: Our baking lab “kneading” dough. 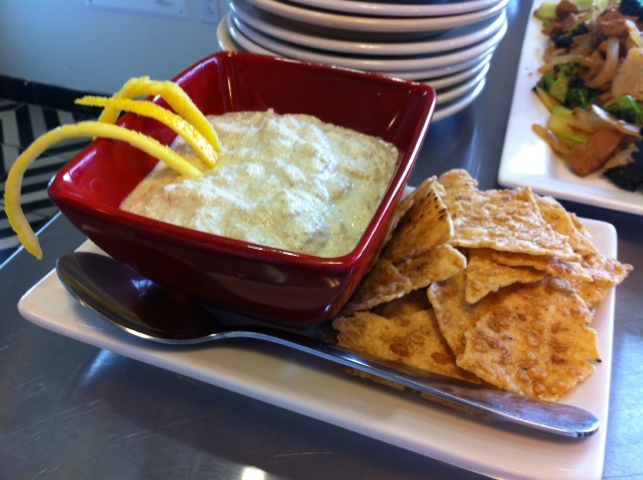 The dough is incredibly gluey because of the natural gluten in wheat, so you could really pound it. You have to work the dough until the gluten proteins bind adequately. 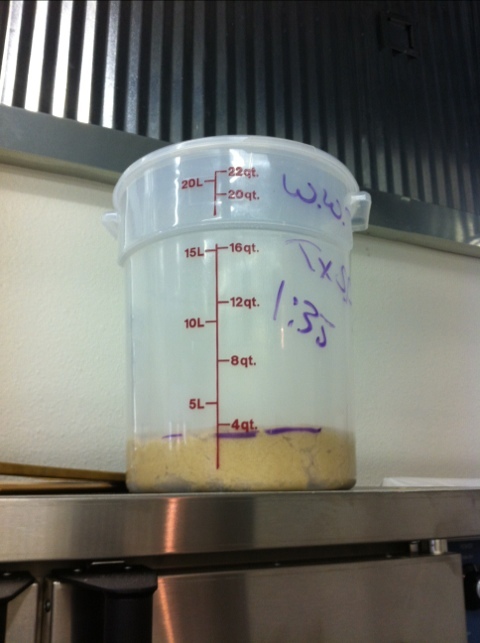 Below: Our mixed dough waiting to double in size. 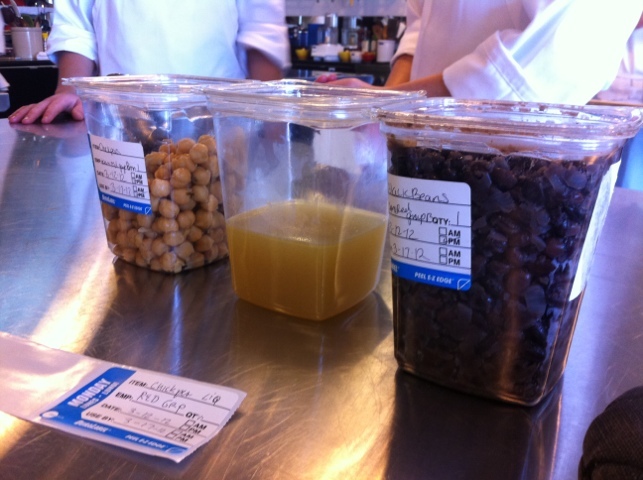 Below: Jean showed us many types of grains and described their properties. 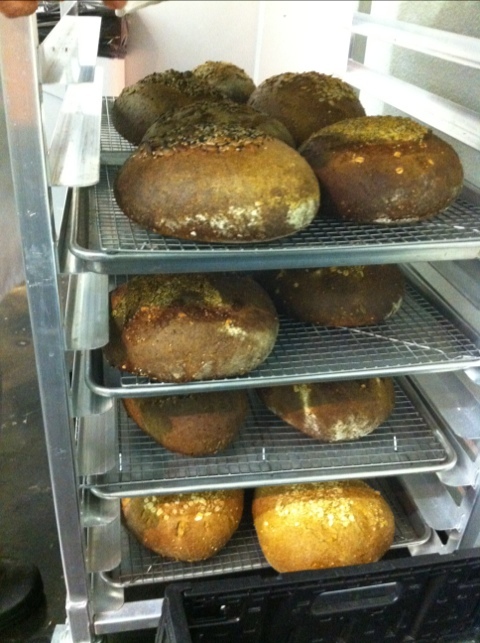 Below: Some of the bread we baked. Okay, I’m not exactly sure how many total weeks I have, but 22 is pretty close. And time keeps ticking away! 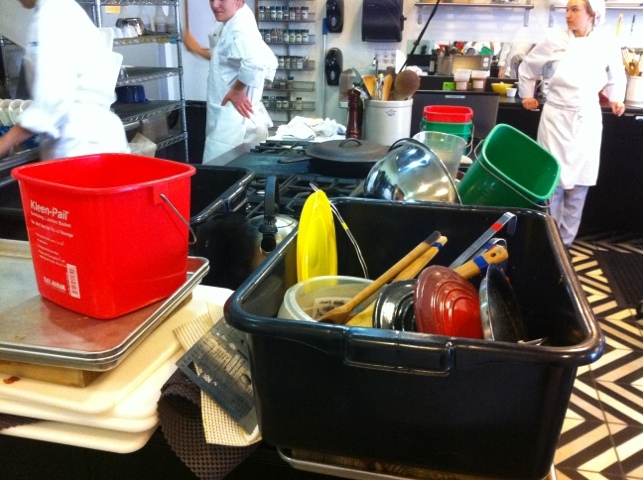 A lot of folks in the program are very interested not only in cooking, but in helping others. 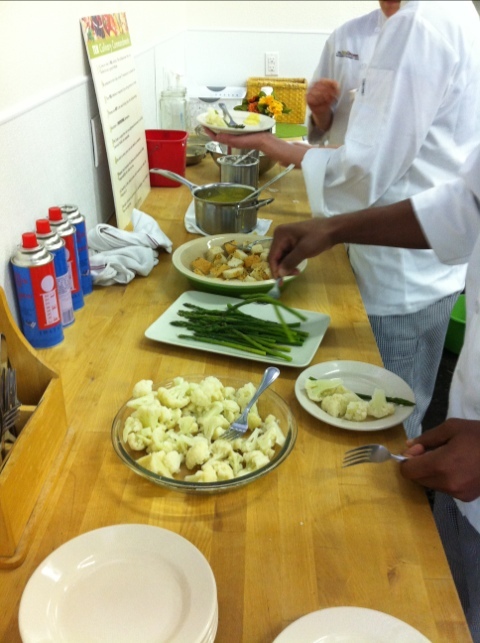 So, the career of personal chef is a popular choice. It certainly has appeal for me, too. The idea of helping someone think through food issues on their way to feeling better is an amazing thing to be able to do each day. I’d much prefer that to selling insurance or writing clever ads or doing soil measurements. I’d also prefer it to hiring, firing, compensating, and training people, which is what I was doing in my last career. Not bad work, but the sense of a higher mission was really hard to grasp most days. 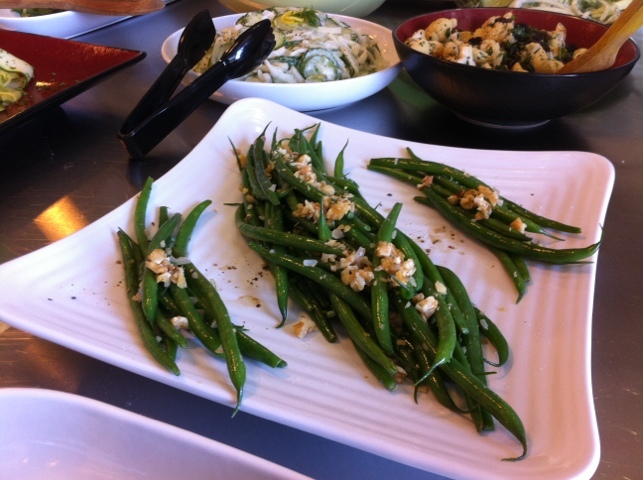 Beans are terrific little powerhouses of carbs, proteins, and fats. Add fiber and lots of nutrients, and it all makes beans are incredible useful things to incorporate into your daily diet if you can. 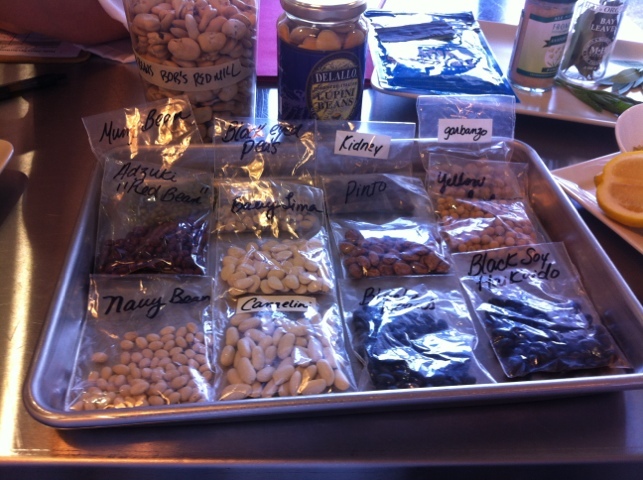 And if you can take dried, bulk beans and turn them into creamy masterpieces, then you’re saving money, having fun, and putting good energy into your food, as well. Below: Lotsa beans to choose from in this life. 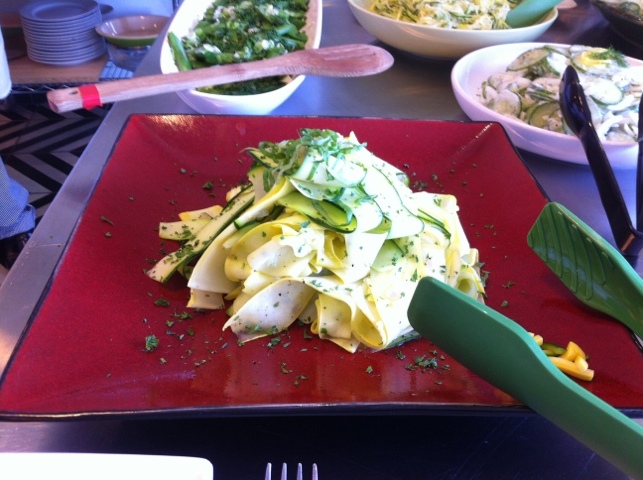 Below: Not a lot of action in this week’s blog post, but here are the delicious results of Monday’s cooking. 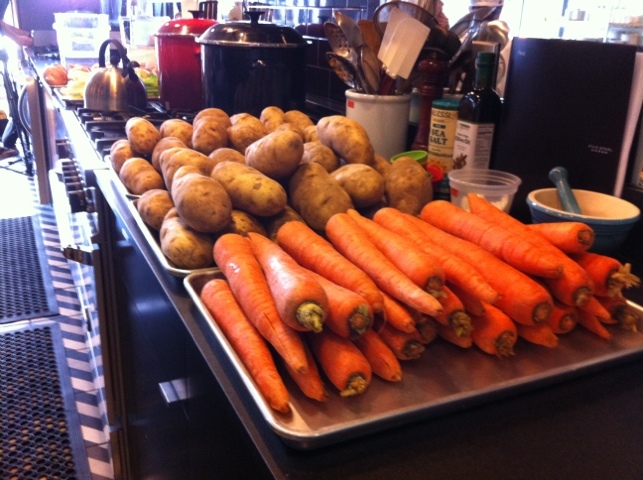 Tomorrow, we turn this into hummus (chickpeas) and black bean patties. 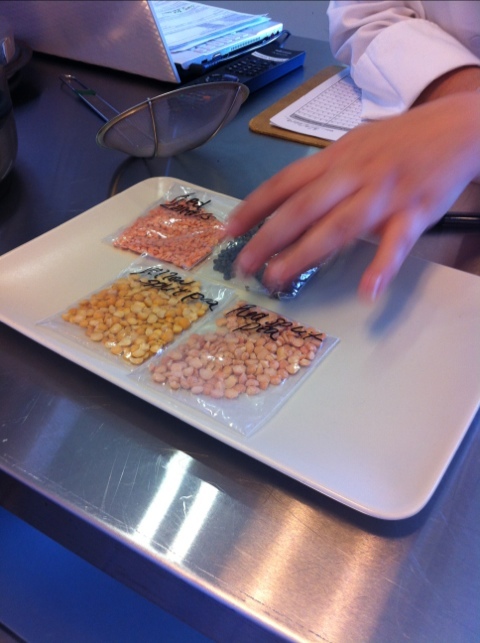 We dove back into grains on Wednesday, after having had our fill (literally and figuratively) of rice. 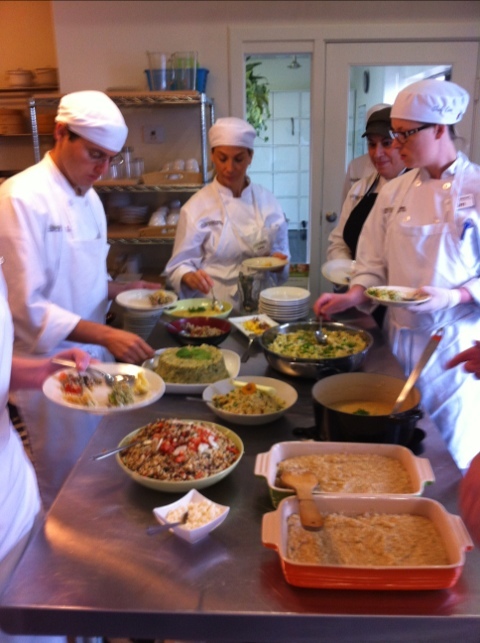 Corn meal, polenta, amaranth, millet, and other grains were on the menu. 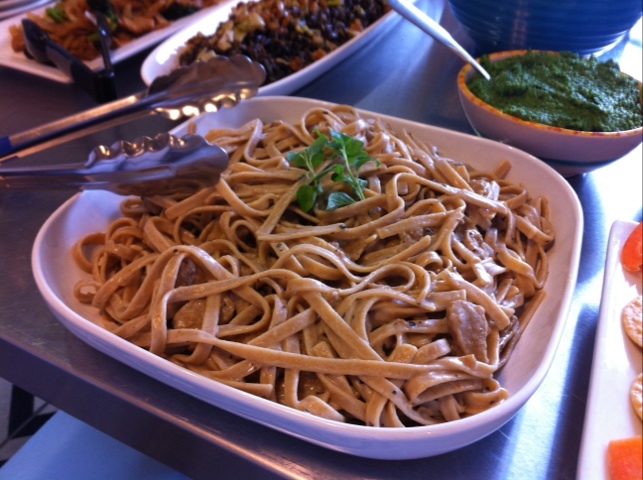 All were whole grains, so we got the most protein, carbohydrates, fats, and fiber intrinsic within each grain. 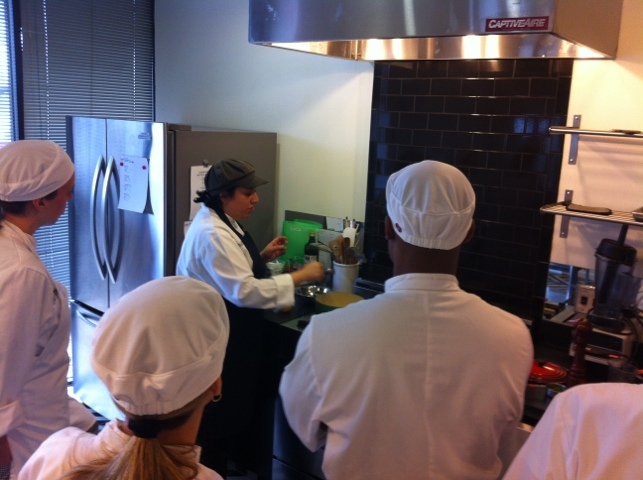 Below: Chef Alex demonstrates cooking polenta. 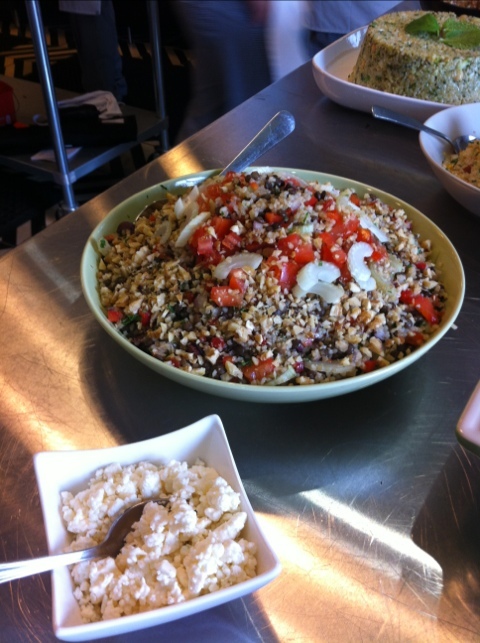 Below: Lentil and bulgur wheat salad – sadly, this was one I couldn’t taste. Feta cheese on the side, so that vegans can try the dish without cheese. 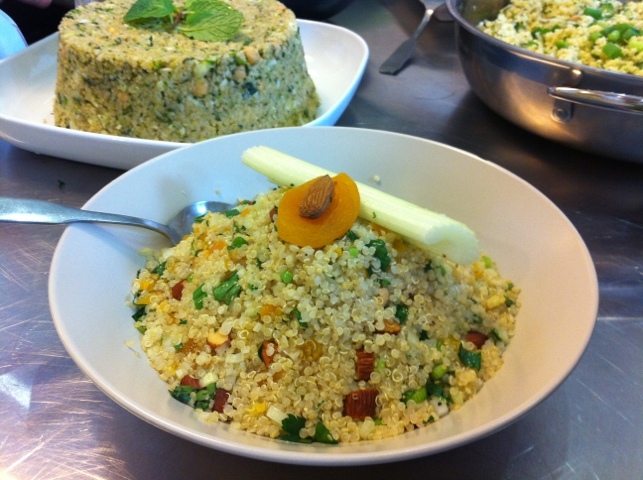 Below: Bulgur wheat tabbouleh (pronounced ta-BOO-lee). 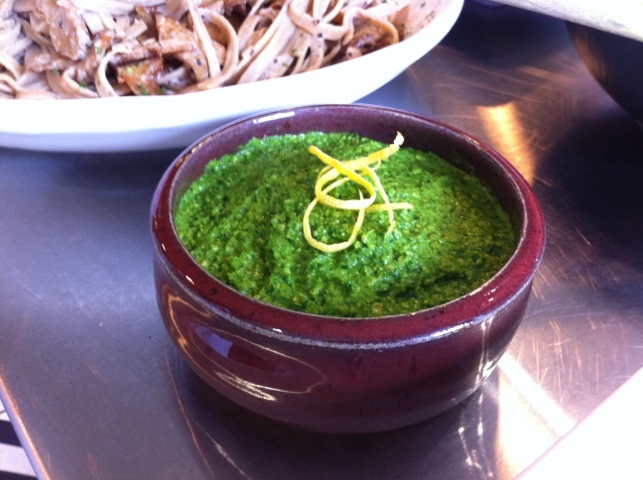 Minty, garlicky, creamy – a new favorite (I eat mine with millet, which is gluten free). Below: A video showing how the above presentation was executed. 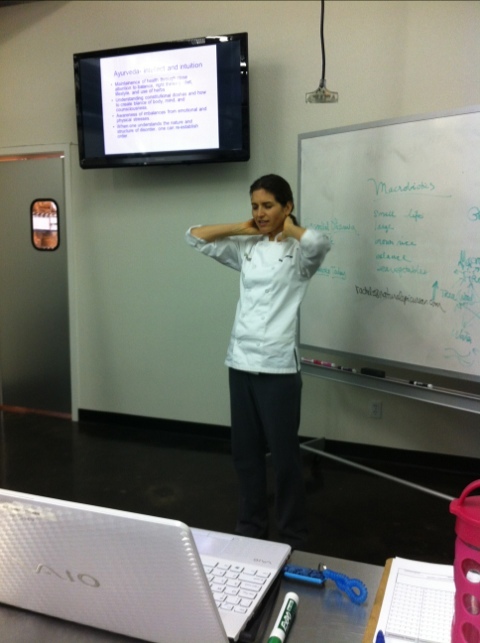 Chef Rachel talked with us about intuition in the lecture portion of the day. 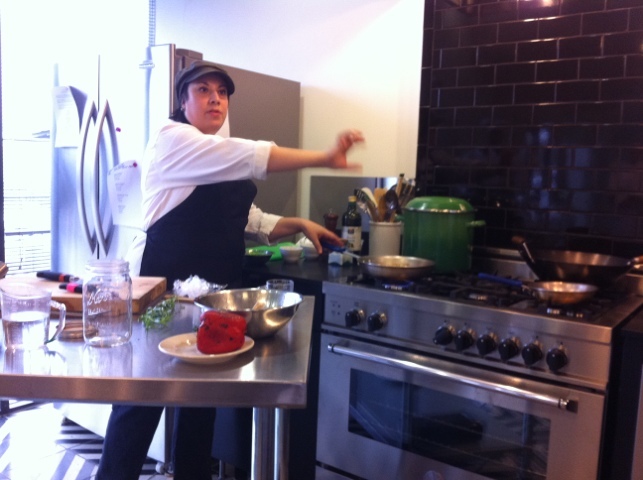 She talked about using intuition in our cooking and in thinking about our wellness. She talked about ways to get more in touch with your intuitive nature. 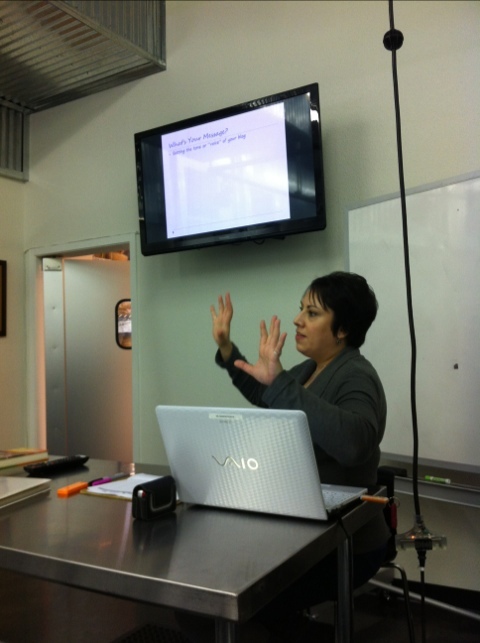 She also talked quite a bit about macrobiotics and ayurvedic principles. She said that we have an innate ability to maintain our own wellness, but we need to set up our lives to facilitate this awareness. 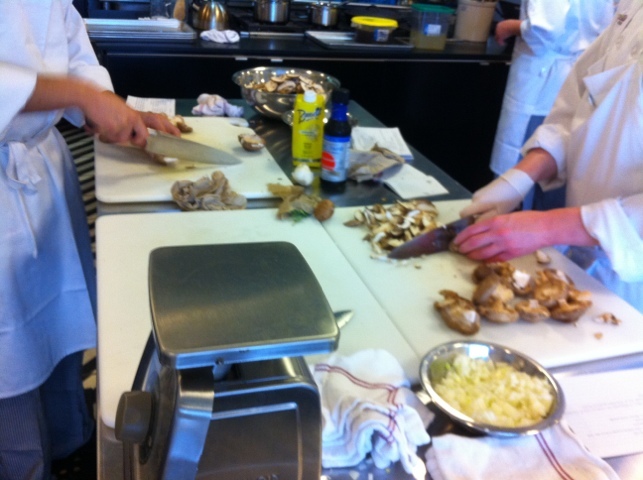 Below: Chef Rachel attempts a vulcan death grip on herself. 😛 Just kidding, she led us through a thoroughly relaxing impromptu Do-in self massage, a type of Shiatsu technique. So nice! 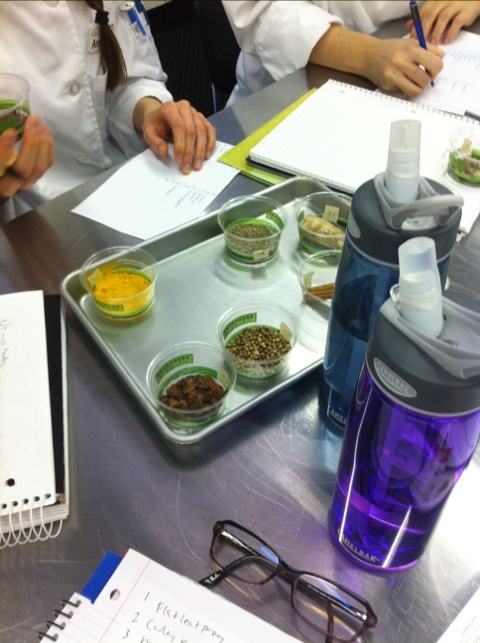 The topics for Monday were grains, herbs, and spices. 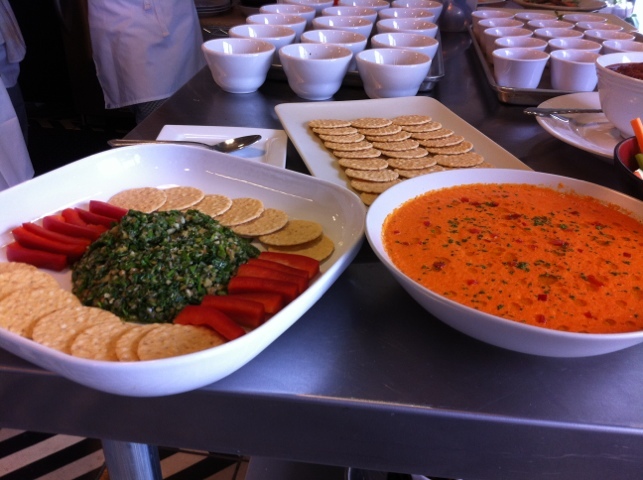 Chef Rachel Zierzow presented to my group Monday morning on herbs and spices. She definitely whet my appetite for getting a spice grinder after she toasted spices for garam masala and ground them in a Krups spice/coffee grinder. The result was a much more aromatic powder than my garam masala at home. 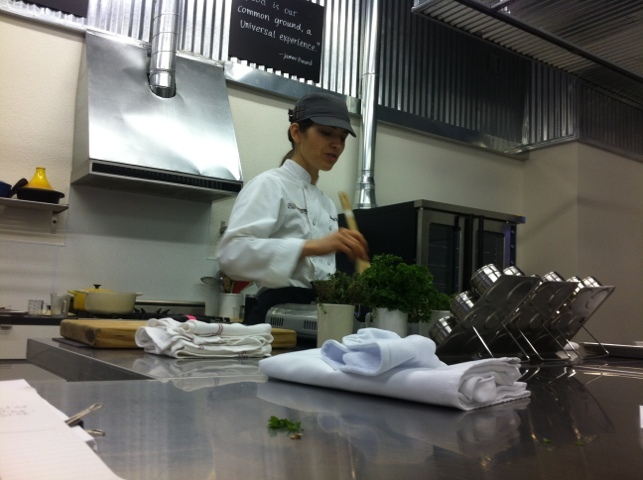 Below: Chef Rachel gets all herby on us. Below: We got a pop “quiz” on herbs and spices. It was fun to see if I could identify all of them by sight and smell alone. 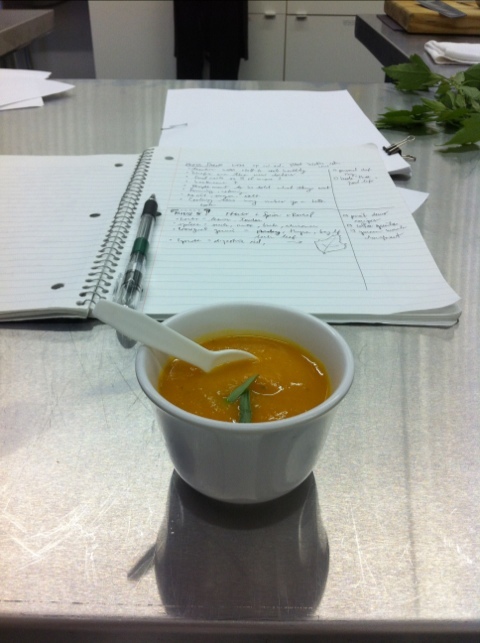 Below: A carrot soup with Garam Masala prepared by Chef Rachel in the demonstration kitchen. 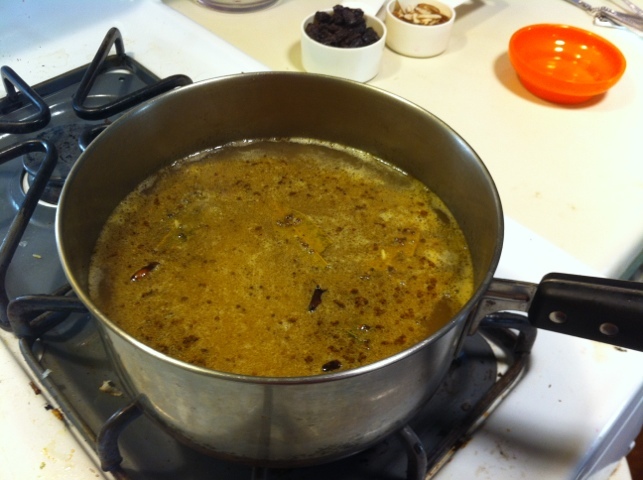 It was subtly sweet with warming spices of the garam masala and blended smooth in a Vita Mix. 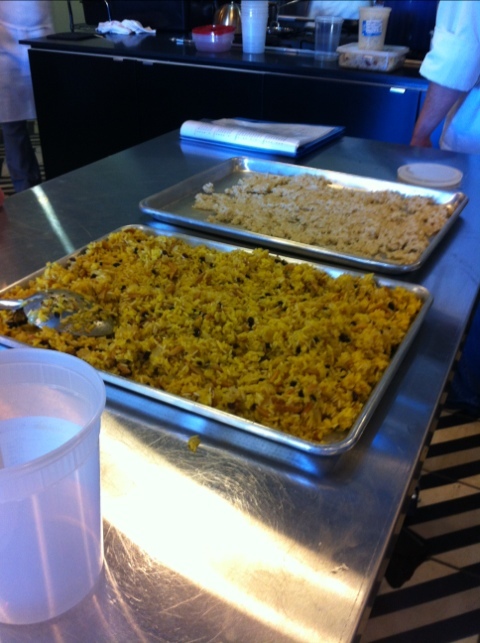 In lab kitchen, we made rice pilaf, brown rice, white rice, and risotto. Rice, you ask? Isn’t that super simple and boring? No way! 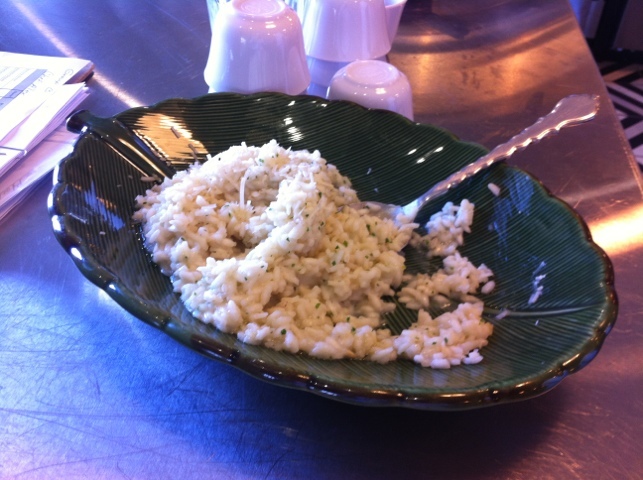 Rice is very versatile. 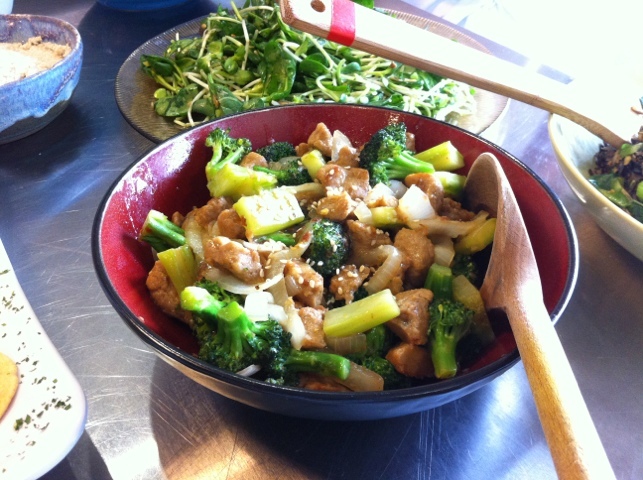 You can add all kinds of stuff to it and pair it with all kinds of foods and flavors. 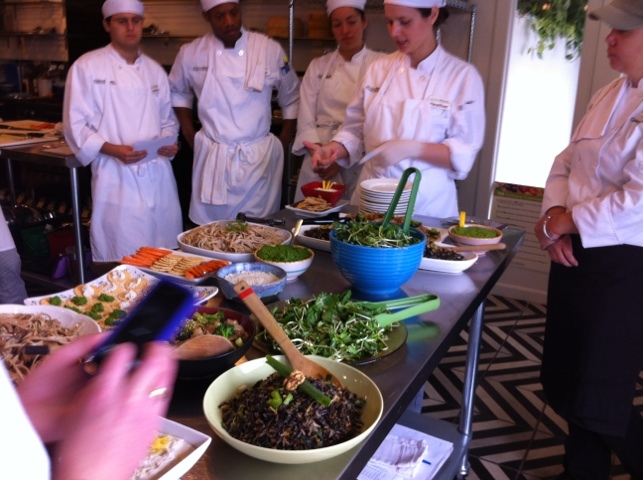 There are many types of rice with different flavor profiles – jasmine, basmati, wild rice, and many others hold aromas and flavors that go far beyond your grandma’s white rice. 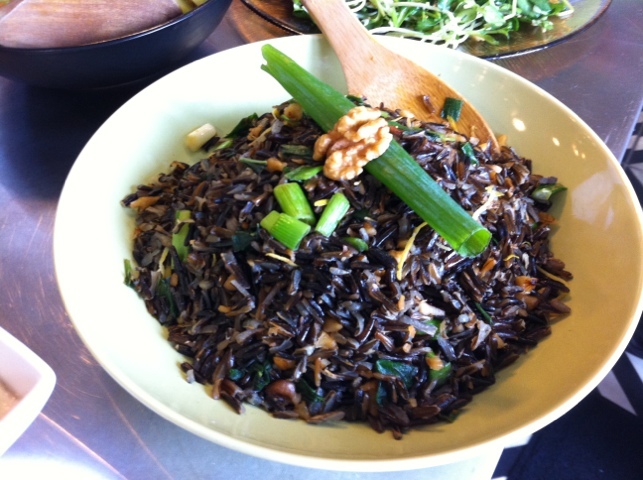 I even cooked some black Forbidden rice recently. 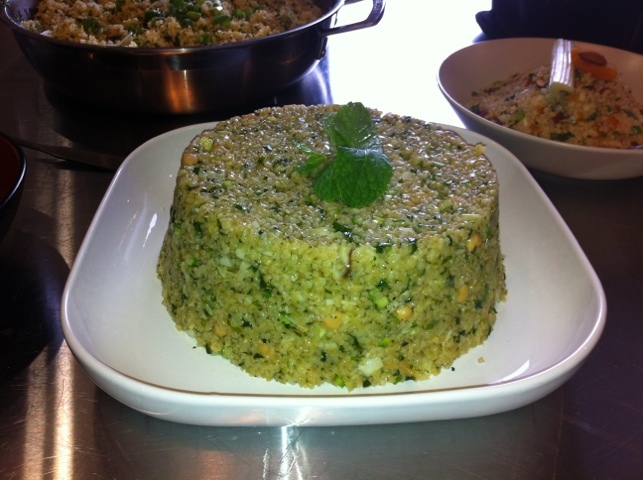 Here’s another great thing about rice, and especially brown rice – it’s minimally processed. Your body has to work a bit harder to break it down. You also can’t eat as much of rice as you can eat of bread, for example, before you realize you are full. Do yourself a favor – cut the amount of bread you eat by half and use rice as your main carb. 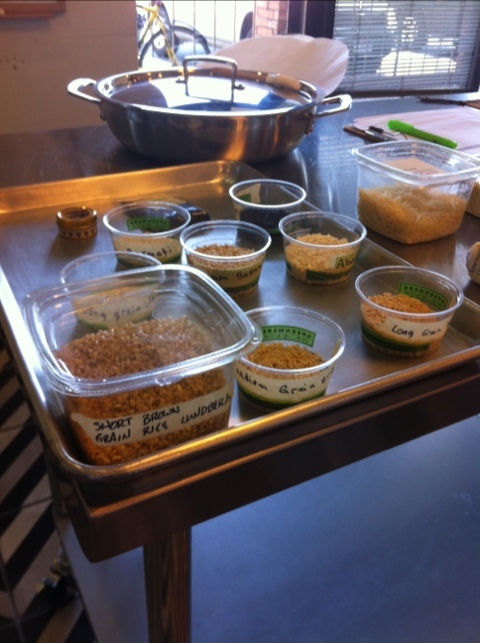 Below: Varieties of rice we reviewed in lab kitchen. 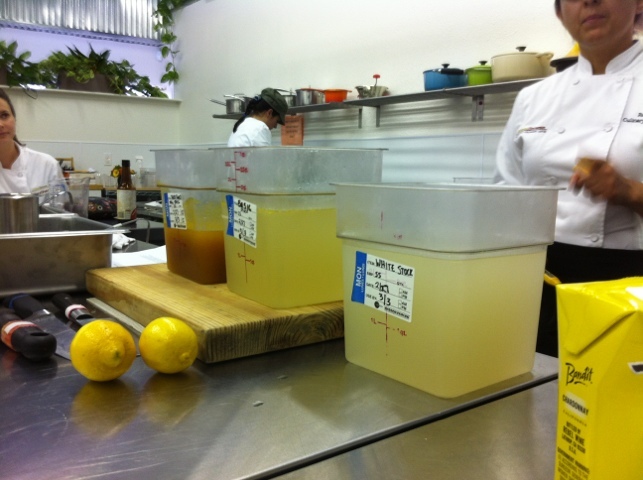 Below: Chef Alex shows us how to rinse rice before cooking to wash off the starchy bits. 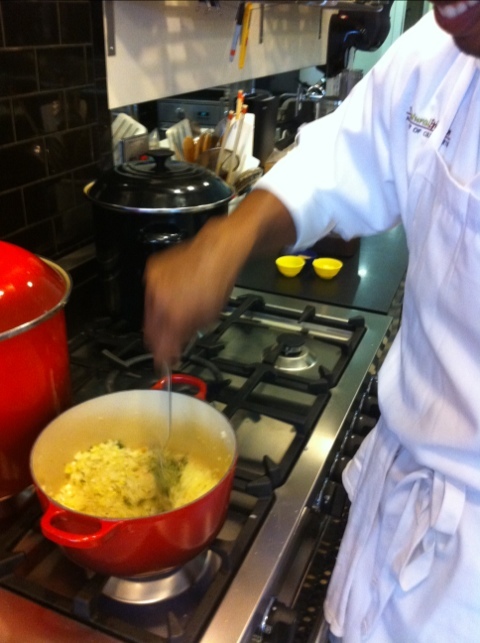 Below: Some risotto that Chef Alex cooked. She wanted to offer us the chance to eat a traditional risotto with butter and parmesan cheese. When I made the risotto, I made it with Earth Balance and nutritional yeast, since I don’t eat dairy for allergy reasons. 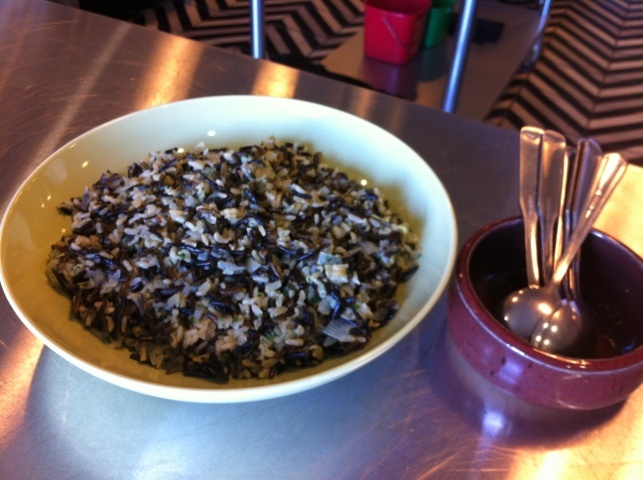 Below: Some wild rice cooked by a student group during lab. Below: Rice cooling on sheet pans. 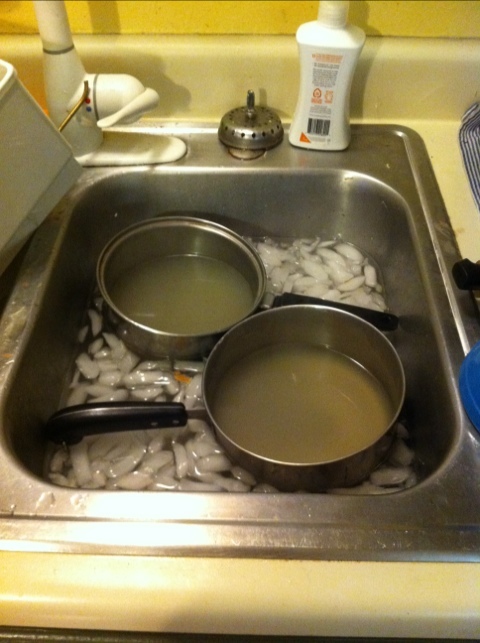 It’s important to cool hot food quickly when you’re going to store it in a cold state. I wanted to practice a bit at home, so I pulled out a recipe for Indian Pulau from my “recipes to try” folder, which is way too thick these days. 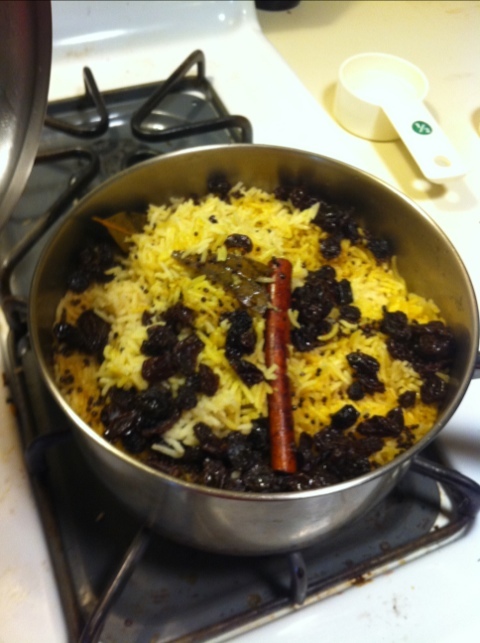 Pulau is a rice dish made from basmati rice and featuring garam masala. There are many variations on pulau. I got my recipe from the 1998 Best of Gourmet, which featured many Indian recipes in the special focus section. Thanks, Austin Public Library! 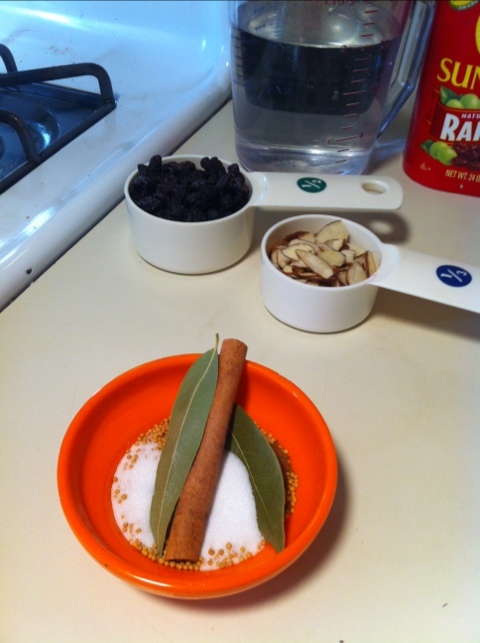 Since I don’t have a spice grinder – yet – I had to use a jar of garam masala rather than make my own. 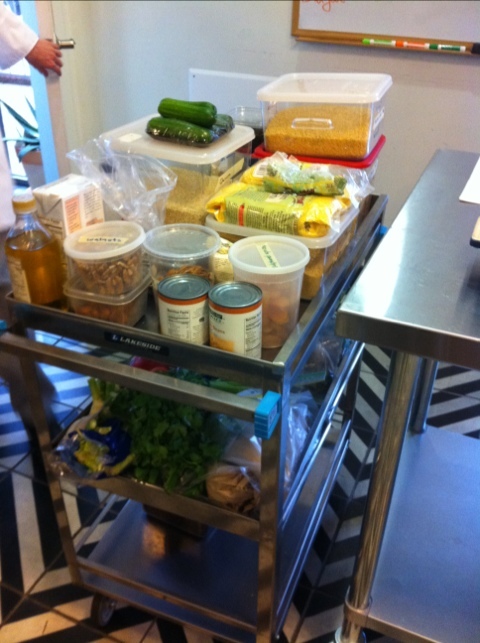 Below: My mise en place for pulau. 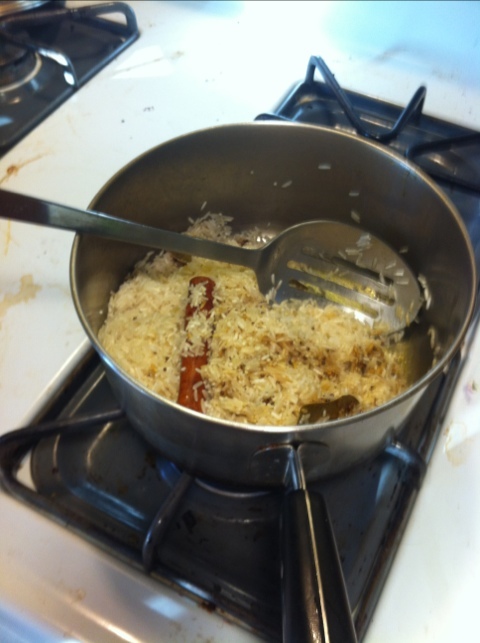 Below: The recipe called for sauteing the spices, then adding the rice to the spices and oil. Only then would you add the water. 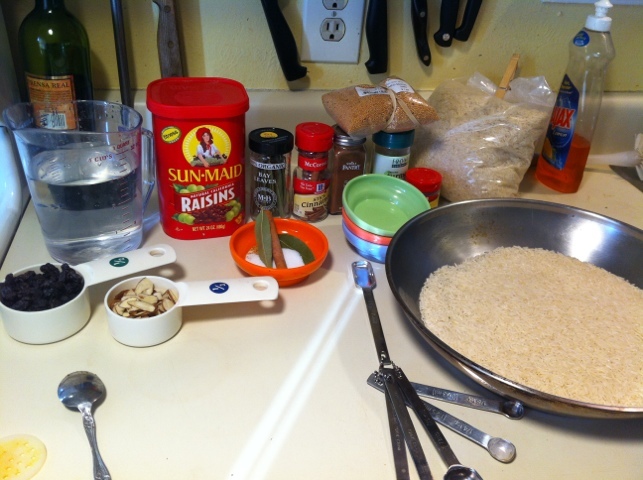 Below: I tossed in the cold, dry raisins and let the rice sit for five minutes. 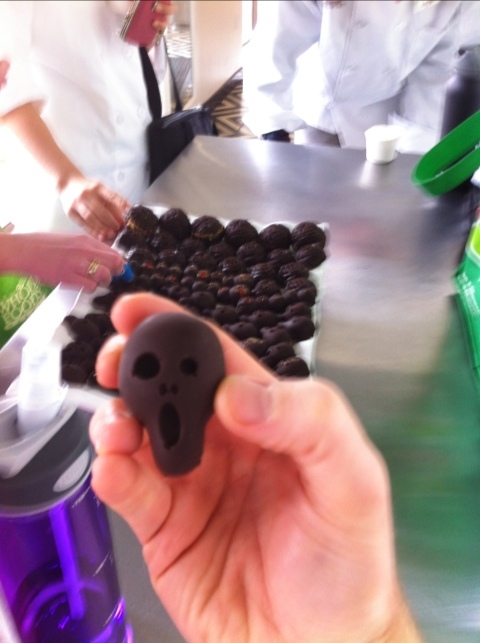 After that, the raisins were plumped up a bit, and were moist and warm. Good stuff! Below: The finished product. Aromatic, mysterious, colorful, with textural and color variations. 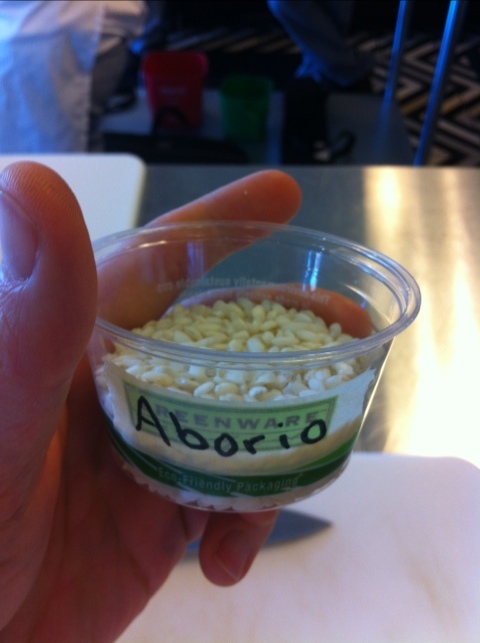 This is not the white rice I grew up with!